The Harpur Hill sports centre, event venue for the 3 Counties mtb event, has unfortunately been closed by Derby University at very short notice and we have been unable to final a suitable alternative venue. Consequently it is with great regret that we have had to cancel this years event and ALL ENTRANTS to this point will be provided with a FULL REFUND to their card account in the next few days via Si Entries. 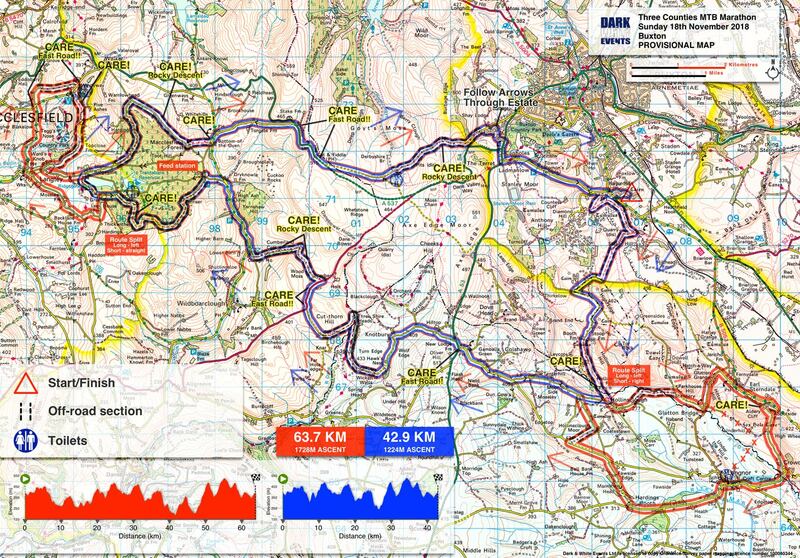 A challenging mountain biking marathon event starting & finishing in Buxton traversing the three counties of Derbyshire, Staffordshire & Cheshire with a choice of two courses: a 63.7 km long route with 1728 m of climbing or a 42.7 km shorter route with 1225 m ascent. The biking terrain is predominantly high level/remote/moorland riding on a variety of tracks and trails with under tyre conditions ranging from easy/smooth to steep/rocky/challenging all in amongst quiet and scenic Peak District/Staffordshire Moorlands countryside – do not expect to see many other people out and about in this area in November! The routes will be partially signed (particularly in ‘key’ places) using highly visible yellow & blue arrows but overall riders will need to self navigate using the course arrows in conjunction with the marked up and the full colour OS 1:50000 route map provided at registration. The use of GPS devices is allowed. GPX files of the final route will be made available to all pre-entrants approx a week before the event. There will be a marshalled control/feed station on each course. SPORTident electronic timing will be used and you will need to punch control points on your ride to register that you have completed the fixed route in full. Control point sites will be marked on your route map and identified on the ground by bright coloured tape on an obvious feature to which a timing box will be attached. “Dib” in the timing boxes at the start, finish, all controls visited and the download box at the end. You must use a SPORTident dibber to take part in this event, you may use your own dibber if you have one (please fill in its number when prompted when you enter) alternatively we will rent you one automatically. We advise all riders to start before 9:00am to ensure they reach the cut off time!! At registration you will have to sign on, where you will be provided with a SPORTident ‘dibber’ (a small plastic tag about 2″ long with a timing chip in it which goes round your wrist) and a bagged colour OS route map. The detailed route map will include positions of any feed-stations, control points, public toilets and route split points as well as emergency numbers in case of problems. This is your own personal guide to the route. Please keep your map with you for the duration of the event. For Gold, Silver and Bronze time awards on each course scroll down to the base of the page; certificates will be awarded at the finish on the day. 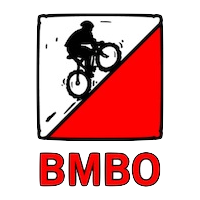 If you have pre-entered and have your own dibber just turn up, check your dibber and BMBO numbers and sign in. No need to queue! No need to stand about. Get up later! Online entry closes at midday Thursday 15th November. If you want to enter late (Friday onwards) or on the day you must contact us first to check availability either by email info(Replace this parenthesis with the @ sign)darkandwhite.co.uk or text 07970 278085. Late entry costs an additional £3.